Aliens / Prometheus / Predator / Aliens vs Predator reboot by Dark Horse Comics! Dark Horse Comics reboots the universe. The Alien, Predator, Prometheus universe, to be exact, so no need for panic, your own timeline is safe! For now at least… aaaanyway. 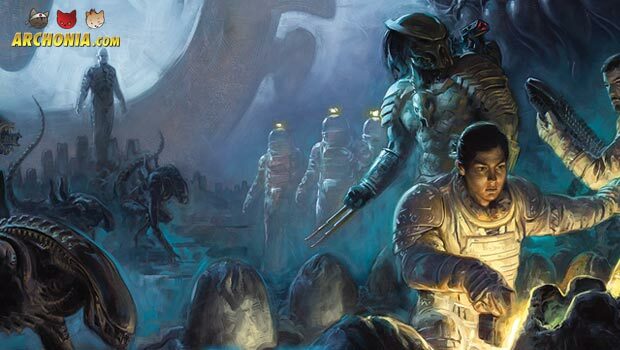 Starting in September Dark Horse starts publishing new ongoing series for Alien, Predator, Aliens vs. Predator and Prometheus, which will all interlock and cross over for the first time. While Prometheus is a series that has never existed before, the three other titles get reboots of their old continuity and start over fresh, to form a cohesive universe with the other titles. [Prometheus](http://www.archonia.com/comicshop/en/article/197131/prometheus+fire+and+stone+%231/) will focus on the mystery of the **Engineers** and all of creation, while [Alien](http://www.archonia.com/comicshop/en/article/197133/aliens+fire+and+stone+%231/) will be less militaristic in nature than it used to be, to hark back to the horror feel of the original Ridley Scott movie. [Predator](http://www.archonia.com/comicshop/en/article/199550/predator+fire+and+stone+%231+%28of+4%29/) will focus on a bunch of anti-heroes that struggle to survive and [Aliens vs. Predator](http://www.archonia.com/comicshop/en/article/199548/alien+vs+predator+fire+and+stone+%231+%28of+4%29/) will focus on the fight between the two legendary movie monsters. The original four Alien movies, all three Predator movies and Prometheus are considered canon, while the events of the Alien vs Predator movies won’t feature into the stories at all (which is not that bad, when you remember those movies). But don’t expect Arnold’s Dutch, Danny Glover or Ellen Ripley in those books, as they will feature all new humans casts, which will be influenced by the old heroes of the franchises. Chris Roberson will write Alien, Paul Tobin Prometheus,** Chris Sebela** Alien vs Predator and Joshua Williamson will helm Predator. All stories will be stand alone, so you don’t absolutely have to read all four, but coming crossovers and nods to the different books enhance the reading experience a lot when you follow them all. Here’s a small trailer for the upcoming event. We think it is a great idea for those titles to share a universe and are geeking out already about the storytelling possibilities. I mean… COME ON… Predators meeting the Engineers from Prometheus?! That is going to be epic! Check it out this fall, coming from Dark Horse! And don’t forget… don’t touch hissing space snakes! Never a good idea.